Next > 11.13.14 gone fishin’, suckers! That gold skull trophy bracelet looks awesome! I’m a pretty solid fan of skulls, aesthetically. Just not a big fan of jewelry on me, though. And there’s only so many skulls I can keep on my desk before my coworkers worry, haha. So long as you don’t name tag the skulls on the desk… “Fran,marketing” “Josh, mailroom” that kind of stuff probably would go poorly quickly. Uh oh, be right back, I, uh, gotta go throw out some labels. Thanks for getting me to laugh out loud in a public place today. Though, it was probably more a SOL- snort out loud. I am a lady at all times! 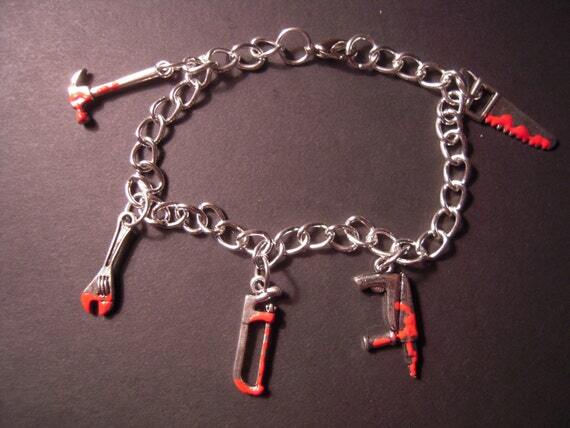 Zombie jewelry never gets old. I would buy all the jewelries but I have my heart set on that skull bracelet. I remember being 17 and in a band doing No Doubt covers and cladding myself with skull and cross paraphernalia. Where was all this when that was going on?! I’m glad you like it! And how about the Rick pic?? Yes! But I don’t know how to pull off that ring thought. That ring is quite massive. Cam you imagine trying to reach into your pocket with that thing on? Anyways, I think Rick himself owns it. Have you seen any of the their comic con panels. If not, I highly recommend it because it’s such a delight to just see them out of their character (and in clean clothes) and I think it’s their own enthusiasm that just makes me go gaga over the show. I bet Rick owns a lot of TWD paraphernalia. But did you know Andrew Lincoln does not even watch the show? How does Andrew Lincoln not watch the show? Why doesn’t he? I think I’ll have to look these clips up on youtube. I saw some cheese-y British romantic comedy from the late nineties and he was in it! I was all “RICK!! !” but he played this sappy, nerdy dude. It kind of creeped me out how well he inhabited that character. Yeah. Love Actually kind of sky rocketed his career. Along with Martin Freeman and Keira Knightley. You are talking about Love Actually right? He says he doesn’t watch the show because he doesn’t want to inform himself of how he acts or the way he speaks. He thinks it will break the spell or something like that. It’s been told that every time they have to play a clip from the show he would shut his eyes and cover his ears and go blah blah blah like a kid. He looks waaay better with facial hair right?? Yeah, I love scruff on a man. He’s pretty easy on the eyes, regardless. The movie wasn’t Love Actually, I wish I could remember the title. It wasn’t any good, however. Tom Hardy was also in it and he played some punk jerking off in the woods. Yeah. Im big on the whole men with beard thing. I am watchig Nick Offerman right now and he is super hot in my opinion. Ehhh Tom Hardy will be such a disappointment. Really 😦 what movies have you been recently loving? You know what, I havent seen one episode of Gilmore Girls. I think seeing gif sets of that show is enough for me. That sounds interesting. I do enjoy the occasional French movie. Have you seen Amelie? I love Amelie!! My favorite French movie is Ne Le Dis À Personne (Tell No One in English)… It’s a mystery/suspense story. I follow stillatthelibrary.wordpress.com and she’s been recommending a slew of Cillian Murphy movies. I know you like them Brits! 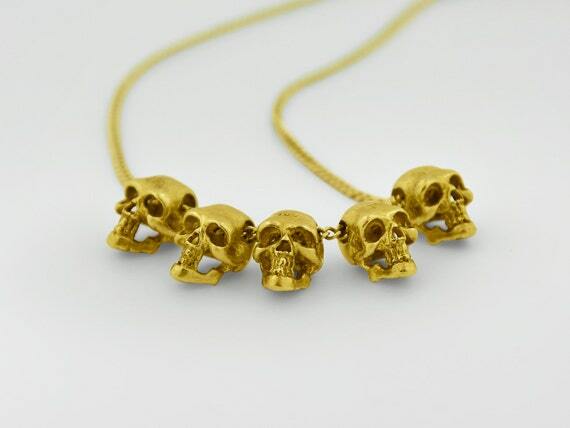 I love the gold skulls necklace. They’re all awesome actually. I do too, that’s my favorite. I love the details of the skulls. The teeth, the jaws. It’s a higher level of workmanship then most Etsy items. Yeah, it’s quite an impressive piece of workmanship. Excellent point! I must have the Governor on my mind for some reason. The Termites were so short lived. Love Actually is one of my favorite movies. I need to watch it again, and soon. Me too. Which is/are your fave arc(s) in the movie? The Hugh Grant one! I love his bashful Prime Minister self ❤ but I also like the friendship arc of the aged rock star and his manager. Frankly, I like most all of them. How about you? Do you celebrate Christmas? It’s one of the best Christmas movies because it’s not all about the holiday but it’s such a happy reflection on the best intentions of that holiday. Bringing joy and goodwill to everyone kind of thing. I like little delicate skull thingies on jewelry and in unexpected places like maybe…I can’t think of a place but maybe…the buttons on a cardigan or something, but without looking too much like I’m a child from Hot Topic. You’re still doing TV jewelry because I would loooooooooooove to see what you can find that’s Peaky Blinders-esque but not steam punk. Go to it girl! You got it! Though I think you might like tomorrow’s fan jewelry. A hint- it’s not a tv show. Also cardigan with skull buttons sounds super cute! Like Doris Day meets Sid Vicious.